“Yin Hong Falls” is an imaginary group of islands inspired by the pale rose veins within a large feather rock found by the artist at a stoneyard. 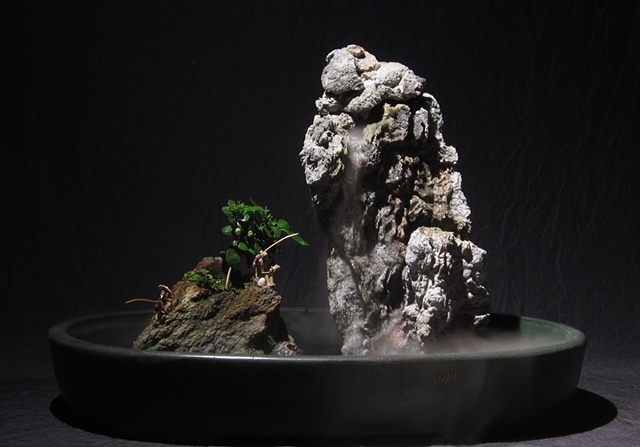 On the foremost island, two fishermen enjoy the shade of a jasmine tree and the nearby waterfall and mist tumbling from the peak, created by an internal pump and ultrasonic mister. The original rock was broken along its fault lines to reveal the colored veins. A rotary wire brush removed the softer stone between the veins, enhancing the character of each piece in the island grouping. The Korean tray, a casting of 85% mica and graphite, was finished with a green lacquer.